The smoking gun. The needle in a haystack. Today’s tech-savvy attorneys need quick and efficient search methods to find key evidence in mountains of unstructured data. 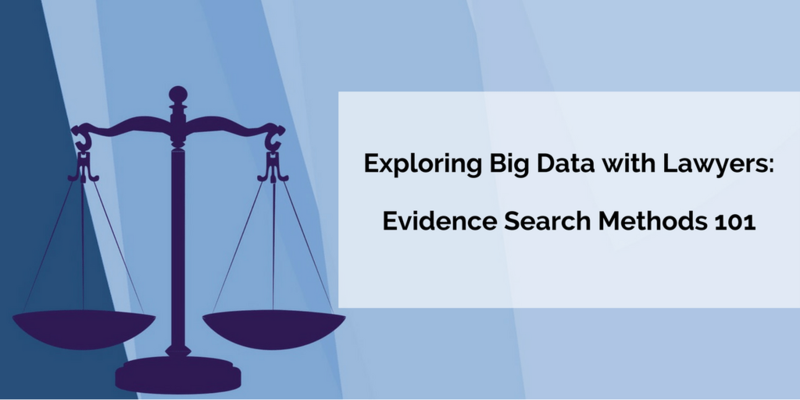 Otherwise known as Big Data, legal professionals may need a big data platform to find evidence at the enterprise level rather than on a case-by-case basis. Let’s explore what Big Data is for lawyers, which leads to an overall data management plan that works in a real-time law environment. What’s Big Data for Legal Professionals? Big Data can be a client’s unstructured, complex set of documents, including emails, digital files, and even data from mobile devices. This can make it hard to find a particular email string that could crack the case. Whether it’s an internal or external investigation, clients rely on their attorneys to find a solution to organizing their gigabytes and terabytes of data into viewable, understandable chunks. According to a Forbes article published earlier this year, the legal profession has seen less innovation in Big Data than other fields – even though 350,000 new cases are brought to court each year in the US alone. This means potential evidence needs to be found in a streamlined, efficient manner. Gone are the days of relying on only exact keyword searching or relying on volumes instead of the validity of data. Thankfully, a new kind of tech savvy lawyer is starting to discover how to use Big Data in research and case preparation. Text analytics, a common tool that is ever-evolving, is used to find the meaning in large quantities of data, such as patterns, intelligence, and structure. To break text analytics down further, The Sedona Conference’s most recent survey distills down to two types of searches: simple and sophisticated. Simple Search Example – Presentation/Visualization Tools. organize connections that wouldn’t otherwise be clear. Search results can a list, cluster, tree, timeline and more. Sophisticated Search Example – Entity Extraction. Otherwise known as data extraction, metadata and files are pulled from unstructured data sources. These two methods are often merged into a holistic approach to searching, which can include technology-assisted review methods such as predictive coding, email threading, content clustering and near duplicate analysis. Thanks to the recently updated Federal Rules of Civil Procedure, courts are now placing more of a premium on quality versus the quantity of found evidence. The new rules went into effect on December 1, 2015 with the purpose of streamlining the legal process and making in-person meetings with lawyers more meaningful. Before the new rules went into effect, courts were still trying to make quality versus quantity the priority. In the case of Biomet in 2013, the Plaintiff’s Steering Committee asked the defendant to redo their evidence search with predictive coding instead of the keyword searching they used. The court ruled in favor of Biomet, citing the proportionality of having to redo the search as overly burdensome. While lawyers can handle their cases with these search methods, it’s better to have a professional consultant alongside them to organize a case. There’s a great need to manage cases with gigabytes or even terabytes of data with professional, enterprise-level software. That’s where Syntelli’s Managed Analytics as a Service (MAAAS) can assist lawyers on the IT level, along with cloud-level and distributed platform solutions like Hadoop. Learn more about what MAAAS can do for you here.